What is better for resale granite or corian? Corian is a good solid surface material for countertops, but granite is definitely the way to go. 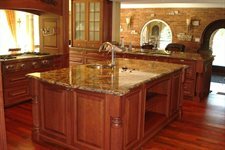 The price of granite as well as other natural stones has dropped over the past 5 years significantly, making granite more a standard now than ever before. For resale of a house, granite is definitely the way to go.